Wow. That's pretty good turn a round. Fingers crossed and let's hope you're GTG! That's what they always say. I remember ones going back in the spring of 2010 for this or that problem and the note said the same thing. Heaven forbid they admit to sending a bad barrel out the door in the first place. However, what matters most is that the problem is and stays fixed, regardless of what it took. I'm guessing that if your problem description said "after x number of rounds, it failed", that once they performed their corrective action, they shot x number of rounds and then a few to make sure it did not happen again. chiming in a little late, but noticed your gas block is not factory. Is there a difference in gas port size from the stock piece? Many aftermarket blocks have oversized holes. anyway..
ensure that it is aligned properly, and if you have the inclination, you can make it adjustable or buy an adjustable one to tune the rifle. Not that you should have to do that though. I also have Hoots bubba carrier system, which really helped with some of my ejection issues. The gas block that's on it is the one that came with it when I bought it brand new. I've not changed anything as far as the mechanics of the rifle yet. In any case, I made it to the range today and fired 40 rounds through it without a single hiccup. No jams, no stove pipes, just a whole buncha shooting and smiling. 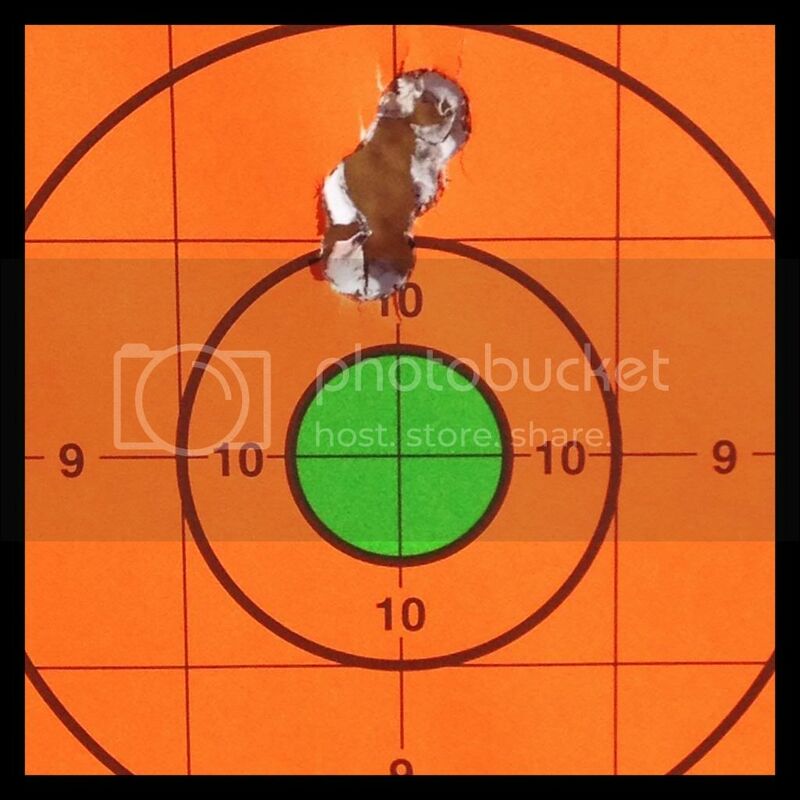 I popped my scope, which I still had mounted in the rings, back on and the photo below shows my first four rounds shot today at 50 yards. Faith is restored. Now those Florida piggies better watch out because I'm on a quest for bacon and I'm bringing Thumper with me. Your ready now, clean the weapon, oil it well, if you're not quite sure of the details, there are tons of YouTube vids on how to do it. Now go fourth and kill something. I want eggs with my Breakfast Ham and TSD won't come if you don't have Breakfast S'mores..
Man, that group looks so familiar! Mine hits like that @ 50 Yds. I have a new member in my AR family as well. Texas Sheepdawg wrote: Man, that group looks so familiar! Mine hits like that @ 50 Yds. Yeah, I was looking at her..
Awhhh and she has you eyes too! They look like two burned S'mores holes in a blanket.. Picked up my "New" early production 20" Upper with factory mag today, she has had a whopping 12 rounds down the pipe since new and isn't even broke in yet. The guy I bought it from sighted it in and has dropped 2 deer since he bought it new. He sold it to me because it ruined too much meat according to him. Anyway, ran through a function check and then wet cycling and then decided to see how she feeds. Feeds and ejects flawless when cycled by hand but tears the heck out of the brass. The top corners of the half moon cut out on the front of the mag are like razors and cut deep into the brass as it's being picked up and fed, anyone see any potential problems with rounding off and smoothing those 2 corners for a bit more clearance ? Ok, just saw the black follower thread is several years old. Any suggestions on current followers I can play around with ? I filed down my mags and polished that front area then opened up and polished the feed lips, and everything works like a charm now. I wonder if you might need to open up your feed lips. I don't think you'll have any problems.